General Motors India launched the Chevrolet Sail today. The premium sedan takes styling, comfort, performance and safety in its segment to a new level. 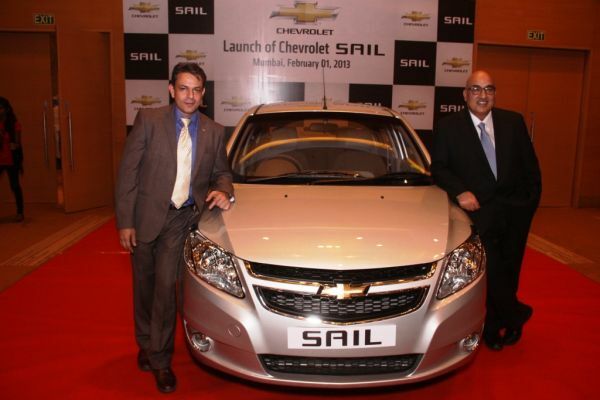 The Sail is built on a new global passenger car platform created especially for fast-growing emerging markets. Engineers at the GM Technical Center-India in Bangalore spent nearly two years refining the platform for India to ensure that it would meet the requirements of the local market and car buyers. 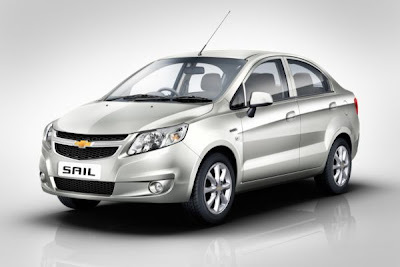 The Sail’s exterior exudes Chevrolet’s sporty styling. It has an aggressive front end based on the dynamic sculpture design philosophy along with a wide stance. Its muscular physique is enhanced by wide-angled jewel-effect tail-lamps and wrap-around headlamps. The front view features Chevrolet’s signature design cues, including a dual-port grille adorned with a gold bowtie that gives it a bold look. “Hawk Wing” headlamps and “Shooting Star” front fog lamps enhance the vehicle’s elegance. From the side, its unique waist-line accentuates the sedan’s dynamic stance. It has a long front and short rear, with a lower stance in front that moves upward in back. Its bold contours give it a classic three-dimensional look, which sets it apart in the segment. The streamlined shape adds a vibrant styling element while reducing drag, for lower fuel consumption. Large panoramic side windows and wide-opening rear doors give it the feel of a much larger car. The Chevrolet Sail is available in seven exterior colours: Velvet Red, Switchblade Silver, Summit White, Caviar Black, Linen Beige, Sandrift Grey and Misty Lake. The Sail’s interior combines comfort and ergonomic convenience. Its Chevrolet Corvette-inspired dual cockpit design incorporates well-supported seats and fold-away rear armrests. The “Rising Sun” instrument cluster complements a luxuriously blended two-tone interior with highlights in silver and chrome. The smart and spacious design philosophy was adopted to ensure the space of a family car, giving the sedan room for up to five people in comfort. Short front and rear overhangs along with a fuel tank situated in the middle of the car maximize interior space and provide among the best legroom in the segment. The sedan’s high roof design offers ample headroom even for taller passengers. Smart and well-thought-out storage spaces as well as a spacious boot provide room for passengers to stow their belongings for a daily commute or weekend trip. The Fun-Wide entertainment system has Bluetooth® functionality. It supports upto five phone pairings and music streaming. The Sail is available with a choice of SMARTECH diesel and petrol engines that provide a combination of power, fuel efficiency and low emissions. The 1.3-litre SDE SMARTECH common rail diesel engine is a revolution in small diesel engine technology. It was developed by the GM Diesel Engine Technical Center in Turin, Italy, with the support of engineers in Pune and Bangalore to achieve a balance between cost, performance and fuel efficiency specifically for car buyers in the Indian market. The state-of-the-art four-cylinder engine delivers power of 78 PS @ 4,000 rpm and torque of 205 Nm @ 1,750+/-50 rpm along with fuel economy of 22.1 km/l. Among its cutting-edge technical features are a lightweight aluminum alloy DOHC cylinder head, lightweight pistons with graphite-coated skirts and anti-friction properties, and low-tension piston rings that decrease weight and increase fuel economy. A short-skirt compact cast iron cylinder block with an aluminum bedplate enhances stiffness. Torsional vibration dampers are provided for improved noise, vibration and harshness performance. In addition, the engine has alow-inertia valvetrain with hydraulic lash adjusters and a lifetime maintenance-free timing chain. The engine’s advanced common rail fuel injection system, close-coupled diesel oxidation catalyst, and electrically operated, water-cooled external EGR with pneumatically controlled EGR bypass effectively limit emissions. A fixed-geometry turbocharger with a vacuum-operated waste gate for smooth and efficient operation delivers superior torque from very low engine rpms. An electronic accelerator control further enhances the engine’s smooth operation. The 1.2-litre SMARTECH petrol engine was created by the GM Technical Center-India in cooperation with GM India’s Powertrain plant in Talegaon, Pune. The engine features aluminum cylinder heads, a deep skirt cylinder block and lightweight pistons with low-tension rings, which decrease weight and maximize fuel economy. The engine also features a DOHC valvetrain with direct-acting valve actuation to further improve efficiency, as well as a long-runner plastic intake manifold for good low-end torque and a lightweight counterbalanced crankshaft that limits noise, vibration and harshness. The engine’s maintenance-free inverted tooth timing chain drive system has chain links that engage at a lower impact speed for quiet operation. The engine delivers uncompromised power and durability in a small package. The application of an epoxy coating on the cylinder block and anti-corrosion coating on cam cover baffles along with the use of stainless steel core plugs and bay-to-bay ventilation ensure a long life. Extensive testing and validation of the engines were carried out in India to guarantee top-of-the-line performance. Both engines are being built at GM’s world-class flexible engine plant in Pune. The Sail equipped with a diesel engine comes with a premium F17 transmission, which is popular in Europe and other parts of the world. It features a high-efficiency two-shaft single housing gearbox with slick shifting for sporty and spirited performance. The gear ratios have been customized to handle demanding traffic conditions in India, which mandate low-end torque delivery. 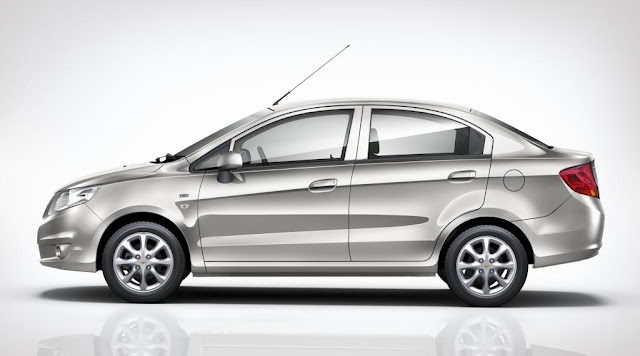 This ensures hassle-free driving in the city and enables quick overtaking on highways. The Sail’s steering, suspension and braking systems have been finely tuned. As a result, the sedan delivers taut, tight handling, which enhances road feedback and connectivity with the driver. Significant attention was given to short as well as long commutes by reducing fatigue-inducing road vibration. Gas-filled front and rear shock absorbers optimize damping to isolate road undulations on rough to coarse terrain. Mac Pherson struts in front and a torsion beam axle rear suspension with gas-charged dampers along with a rigid chassis work together to maximize ride quality. Large 14-inch tires enable the Sail to negotiate speed bumps and potholes with ease. In line with Chevrolet’s global focus on safety, the Sail comes with an extensive array of active and passive safety features. It includes safety cage body construction, which is supported by the extensive use of high-strength steel. The three-point structure is capable of dispersing 80 percent of the force in a front impact. It also prevents intrusion into the cabin. The fuel tank is protected by steel beam-rolling ribs. An engine immobilizer, central door locking, speed-sensitive automatic door locks and remote keyless entry enhance active safety. In addition, three of the four Sail variants come with air bags, while anti-lock brakes (ABS) with electronic brake force distribution (EBD) are available in the top two variants. The Sail has been put through more than 6.3 million km of testing on different terrains and in extreme climate conditions across India and in other countries. To further meet the highest quality expectations of customers, 1,567 parts and components underwent the same stringent global testing that GM applies to its luxury cars. GM’s global quality management processes and standards were also applied in R&D, procurement, quality control and manufacturing. The Sail comes with an industry-first 3-5-3 advantage: a three-year/100,000-km (whichever comes first) standard warranty; a five-year/150,000-km (whichever comes first) engine and transmission warranty; and the three-year/ 45,000 km (whichever comes first) Chevrolet Promise. The Chevrolet Promise can also be optionally bought upfront by consumers by choosing the Chevrolet Promise Retail Package as a free maintenance package for 3 years or 45,000 km (whichever comes first) under which the vehicle maintenance including cost of consumables, parts and labor cost are covered for the said period at no additional cost. The only exclusions are tire replacement, battery replacement, accident repair and accessories repair or replacement and Car care / detailing products.